Today we're decluttering CD or DVD collections. If you don't have very many in either collection you can do both. But I'm guessing most of us will only be able to tackle either CD's or DVD's today. CD's and DVD's can take up a lot of space on shelves or in entertainment units. Many people are moving to digital entertainment, but others like displaying their large collections that they've taken years to build. Chances are though, you've got some CD's or DVD's that you no longer need, use, love, or have the space to store, which makes them clutter. Sell some (Ebay, Amazon, Kijiji, Craigslist, or used entertainment store). Just make sure your efforts to recoup some of the cost of the CD's and DVD's don't end up leaving you with piles cluttering up your house for weeks or months! 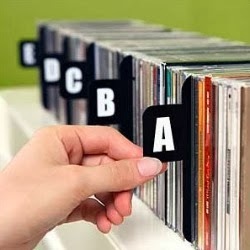 *Note: many people have digitized their collections of CD's or DVD's. According to copyright laws, you can't have a digital copy without the original (unless you purchased it digitally of course). That means you can't give away or sell a CD or DVD and keep the digital copy. Your choices are to throw away the original copies or store them somewhere else. Nothing that allows 2 different people to have a copy. Once you've decluttered your CD or DVD collection, make sure you follow the one-in-one-out rule to avoid cluttering your collections in the future! 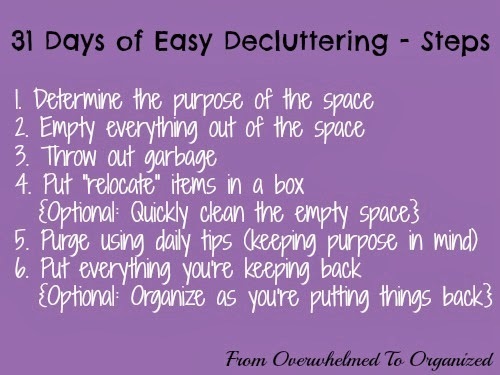 Peter Walsh gives a great strategy for decluttering your CD's and DVD's in this post for Oprah. He calls it the ratio-reduction rule (click the link below the picture). 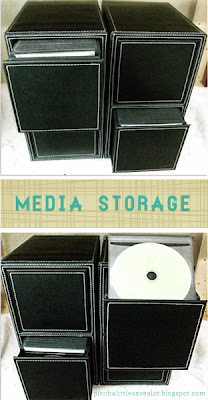 Here are some more decluttering tips for CD's and DVD's, as well as storage options. This is one solution for storing your collections. Bekah also includes a printable inventory sheet you can download. You can also purchase sleeves that allow you to keep your DVD covers without all those big cases. Then you can store them all in a basket (check out the post to see how they did it!). Here's a place where you can digitize your collection and they'll store the originals for you. For more CD and DVD organizing ideas, go to my Living Room / Family Room Organizing board. How many CD's or DVD's did you declutter today? 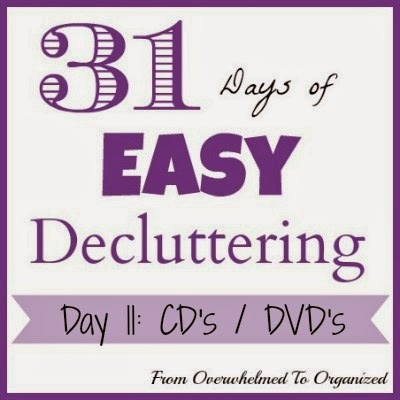 How do you organize your CD's or DVD's to keep the clutter at bay? Any purging tips I missed?